Party document updated from time to time. Socialist Party congress, 14-15 February 2015: This document was produced on 5th January 2015 and subsequently some amendments were incorporated during and following the 14th February congress discussion on Britain. 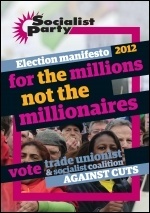 For the millions not the millionaires - vote Trade Unionist and Socialist Coalition against cuts! Party document, March 2008. This document was debated at the Socialist Party congress in March 2008 and agreed. The Collapse of Stalinism; Marxism and the British Labour Party - the 'Open Turn' debate; Party, Programme, Reformism and the International - the 'Scottish debate'; The Name Change debate; What Are the Causes of the Current World Capitalist Crisis? ; Democratic Centralism. Can a capitalist slump be avoided? A reply to ex-Merseyside Socialist Party members by the Socialist Party executive committee. June 1999.